Over many years our annual exhibitions during March and April of work by Doris McCarthy were much anticipated. It is with pleasure now that we present some of those major works from private collections, recently made available for sale. 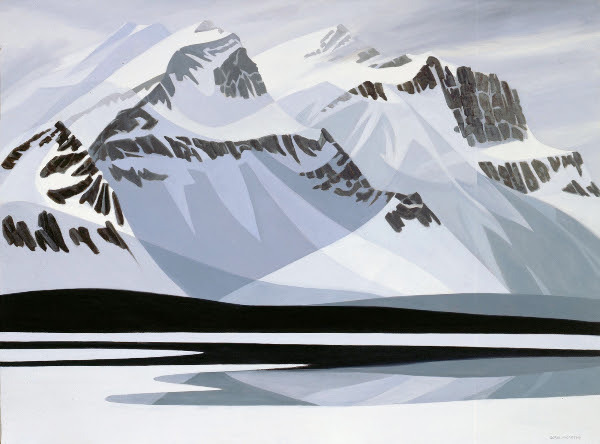 Mountain Image #3 is a highlight of McCarthy’s painting in the 1970′s. In conjoining the hard edge abstraction, which she had developed in the 1960′s, with the more literal landscape painting she created a dynamic body of work, lifting her career into a new realm. 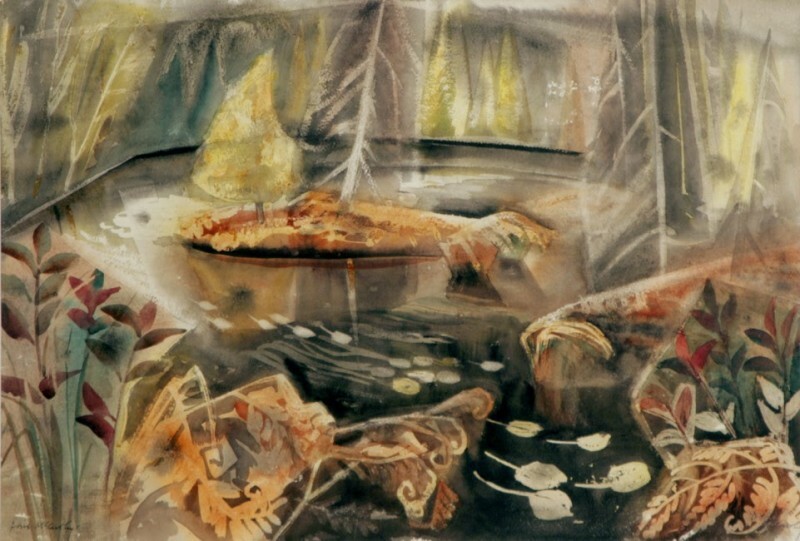 It was included in the major survey exhibition of McCarthy’s work, and book, Feast of Incarnation, 1991, at the Gallery Stratford and featured in the book, Celebration of Life, that accompanied her major 1999 retrospective exhibition at the McMichael Canadian Art Collection, among others. 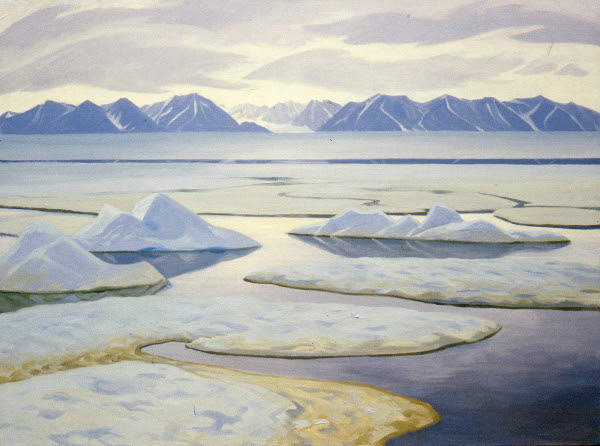 McCarthy made annual trips to the Canadian Arctic, from 1971 through to the 2000′s. In this prime painting from a seminal trip to Pond Inlet, McCarthy captured the immense expanse of the land and extraordinary light. McCarthy visited Newfoundland at a time when reaching some of the small out ports and villages was not possible by road. She travelled around the coast on supply boats staying for a time at sites that interested her. Daniel’s Harbour was a favourite. The structure of the buildings and the potential for composition and light never failed to capture her imagination. 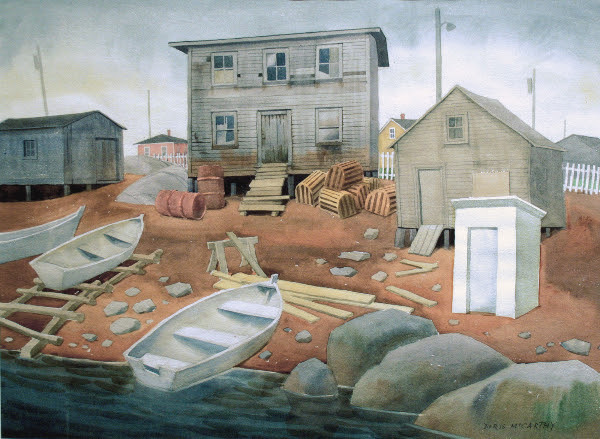 With her skill in both composition and the handling of the watercolour process she could reveal the essence of the place, as in this fine work. It was McCarthy’s custom to make at least one sketching trip in the fall. In the 1950′s that was often to Haliburton, Ontario, where for a few years she returned to the same spot on Sanctuary Lake, which held a special resonance for her. Each time she captured the changing colours and light, never the same but always memorable, as in this watercolour. McCarthy made her first trips to Haliburton as a youth and never lost her passion for the place, travelling there whenever possible at any time of the year. 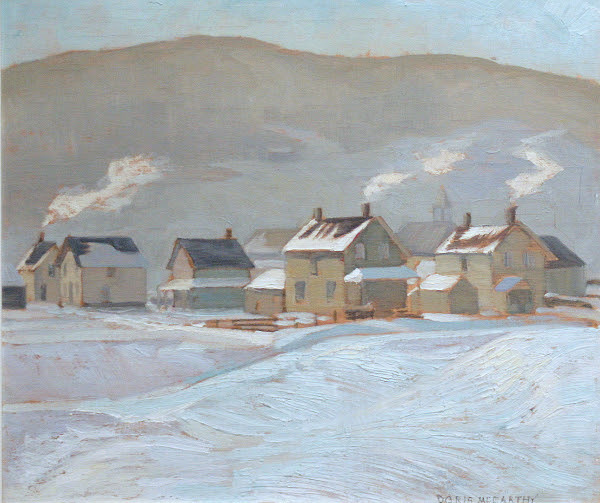 For her, winter provided opportunities for studies in light and composition, taking full advantage here in Haliburton, New Years Eve Day, masterfully capturing the warmth of the huddled houses in contrast to the wintry December air. It was the custom, on occasion, for artists travelling with their kits, painting en plein air, to to use both sides of the panels, saving costs and bulk. This is the reverse of the Haliburton, New Year’s Eve Day painting, probably done the previous summer on her annual Gaspé, Quebec, sketching and painting trip. The juxtaposition of the very different villages at opposite times of the year make for an intriguing pairing. The frame allows for viewing both paintings. Posted May 11th, 2015, by admin.